Changing leaves, hay rides, sweaters, crisp days, football games, and pumpkin spice everything. Fall is just around the corner! The changing seasons can be an exciting time, but it’s also a time for you to pay close attention to your skin. Just as you change your wardrobe for each season, you will need to switch up some portions of your skincare regimen as well. When you are exposed to changing environments, especially with the weather becoming drier during the fall, your skin can be one of the first parts of the body to show those effects. 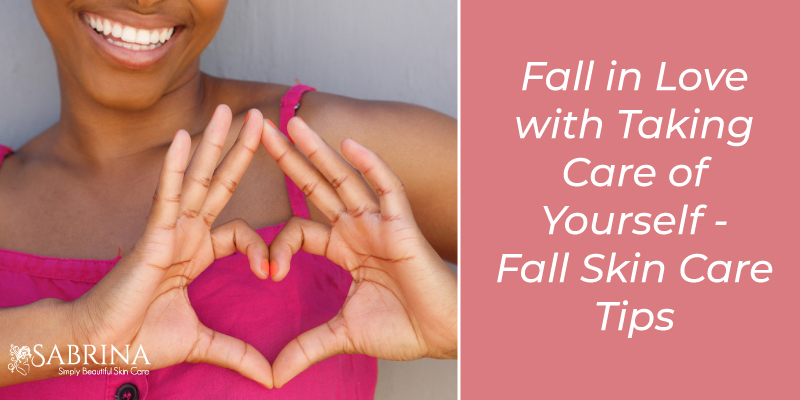 To help prepare you for this coming fall, here are a few fall skincare tips to keep in mind! In the spring and summer, you may be using a thinner moisturizer that keeps the skin hydrated all while preventing clogged pores and leaving your skin feeling light, healthy, and breezy. Because fall means cooler, crisper days, this means your skin will be more prone to drying out. To keep your skin properly hydrated during the weather changes, you will want to switch your moisturizer to a thicker, more hydrating formula. When you make this transition earlier on (think early to mid-September), your skin will be better prepared and may not be as shocked by the weather change, which can ultimately save your skin from going through periods of dryness as the cooler days arrive. Your skin will thank you for it! To find the best moisturizer for you and your skin, talk with your dermatologist. 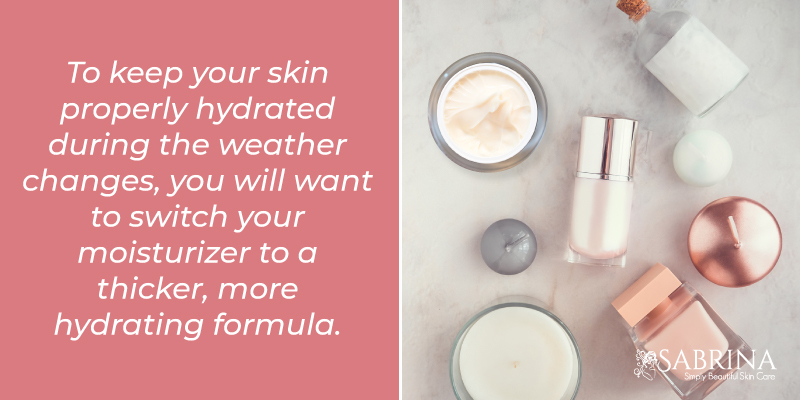 As the weather changes and becomes cooler, your skin will begin to dry out and become a little flakier than usual, especially if you haven’t switched up your moisturizer just yet. When you notice this change, you may automatically think to up your exfoliation game to keep that flakiness away, but you should actually do the opposite. Exfoliation is beneficial to your skin, but you will not want to overdo it, especially as fall approaches. If you exfoliate too vigorously or exfoliate more than once a week, your skin can become easily irritated, more dry, and over-stimulated. While exfoliating in the bath or shower, make sure to scrub gently, use warm water (hot water can irritate and dry out the skin even more), and pat your skin dry with a towel after you are finished. If you have concerns about exfoliating, experience excessive irritation, or think you may be using the wrong scrub, consult your dermatologist for more information and insight. Many think of shorter days, cooler temperatures, and spending more time indoors when they think of fall, so they may pack away the sunscreen until the spring. Sunscreen is essential for protecting your skin against the sun’s powerful UV rays, reducing your risk of skin cancer and preventing signs of aging from creeping up. Be sure to apply at least an SPF of 15, and cover all exposed areas of your skin. Fall means cooler temps, so more of your skin will be covered by long shirts, long pants, closed-toe shoes, and scarves, but you will want to make sure any skin that can be exposed to the sun is well-protected. If you are exercising, sweating, or spending an extended period of time outdoors, be sure to re-apply your sunscreen at least every two hours. 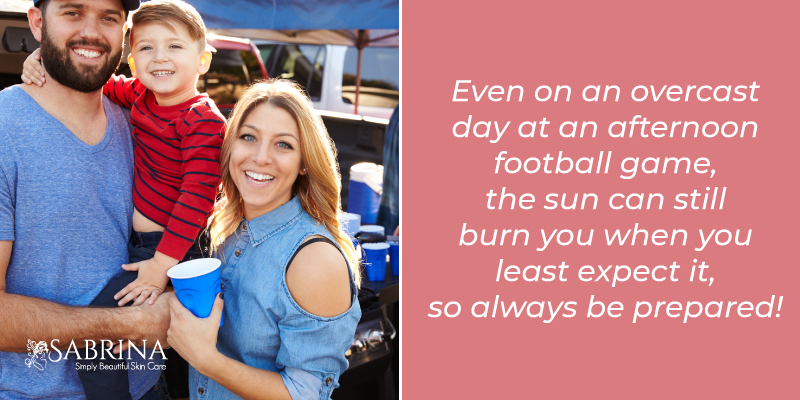 Even on an overcast day at an afternoon football game, the sun can still burn you when you least expect it, so always be prepared! Because fall means cooler weather, dry skin is an issue that should not be ignored. When your skin becomes drier and isn’t moisturized regularly (or you forgot to switch up your moisturizer to a thicker formula), you may notice wrinkles, fine lines, and other signs of aging appearing faster than normal. Because your skin is more sensitive during the changing seasons, especially when the days go from warm to cool, these signs of aging can often be more noticeable than they are during other times of the year. This is where having an anti-aging face cream in addition to your moisturizer can help you out more than you may imagine. If you’re looking for an anti-aging cream that can work all year round while minimizing pores, reducing age spots and acne scars, and filling in wrinkles, check out the SABRINA Collagen Rx Plus Anti-Aging Face Cream. This formula works to boost collagen production, which helps your skin stay elastic, smooth, healthy, and youthful. Keeping up with your anti-aging regimen, especially as fall quickly approaches, will benefit your skin and get you ready for the cooler days ahead!